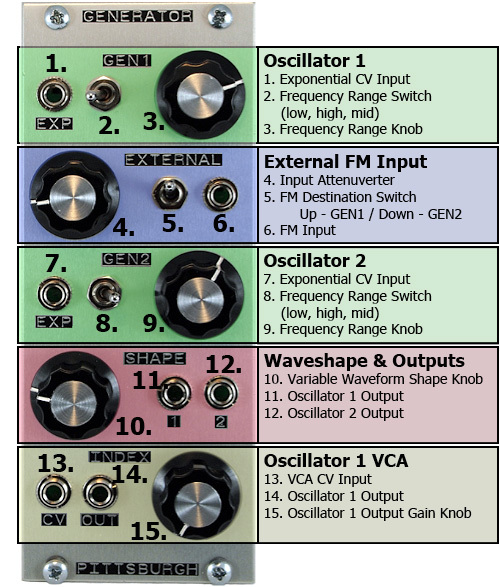 A dual oscillator built around two triangle core, wide range, periodic waveform generators. As a multipurpose signal generator, it can provide the basis of a wide range of complex sounds ideal for tuned percussion/noise, abrasive amplitude, frequency and timbral modulation. Tones, drones, textures, and drums to atonal, nintendo zipper/fart noises. 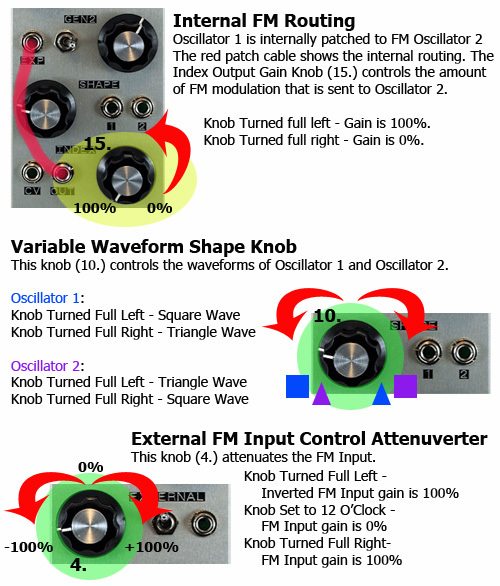 This module was made for FM madness. EXP - An exponential CV input to control the rate of Generator 1. Although it is an exponential response, the Generator does not track 1 volt per octave and is not temperature compensated. RANGE POT - The fine adjustment for Generator 1 frequency. INPUT ATTENUVERTER for the CV input. Pot zeros out at 12 o'clock. DESTINATION SWITCH - Determines which Generator (1 or 2) is modulated. Up modulates Generator 1, down modulates Generator 2. EXTERNAL INPUT - Accepts CV and audio rate signals as a modulation source. *Generator 2 is exactly the same as Generator 1 EXCEPT... Generator 2 is FM'd internally by the Generator 1 Index Out, which means the amount of internal FM of Generator 2 is controlled by the Index Pot and/or Index CV input. EXP - An exponential CV input to control the rate of Generator 2. Although it is an exponential response, the Generator does not track 1 volt per octave and is not temperature compensated. RANGE POT - The fine adjustment for Generator 2 frequency. OUT - Post Index VCA Generator 1 output. INDEX POT - Gain control for Generator 1 Index VCA. The Index Pot is not an attenuator for the Index CV input. Full left is 100% gain. Full right is 0% gain. Turn the Index pot full right to get the full effect of the CV input on the signal. Turn the Index Pot full left to get 100% regardless of CV input. Patch the output of Generator 2 (2) into the External CV Input and set the External Switch to the up position to modulate Generator 1. Patch an envelope generator into the Index CV. Listen to the Index Out. If you set the Generator 1 Range Switch to the low position and the Generator 2 Range Switch to the mid position and adjust the fine frequencies, you get a nice percussion sound. The Generator circuit was designed by Thomas O’Connor.